Christopher and Andrew are current with “Arrow” and “The Flash”. “The Flash” continues to impress. “Arrow” needs to be a superhero show again. Patrick is in full Trek mode. He has finished “Star Trek: Voyager” and has moved onto “Star Trek: Enterprise” He prefers the latter. Jolene Blalock gets special recognition this week. Christopher has started “Caliban’s War“, calls it outstanding. He further asserts “Darth Vader” is best of Star Wars comics Marvel has released. Andrew and Christopher have both finished “Batman Eternal”. Andrew is current with “Thor” and is enamored with the book on multiple levels. He doesn’t even care who the female Thor will turn out to be. Andrew talks “Destiny” and the announcement of House of Wolves expansion dropping on 5/19/15. Christopher and Diablo III continue their love affair. Patrick has started up “Dragon Age Inquisition” once again and he is now playing a Ranger. It scratches his RPG itch. He continues his table top mission and plays the card game “Smash Up“. It allows for Ninja Unicorns. Christopher and Andrew give their nods of approval. Boys are challenged to guess the total number of pages in “A Song of Ice and Fire” One of them actually comes close. The number is huge. 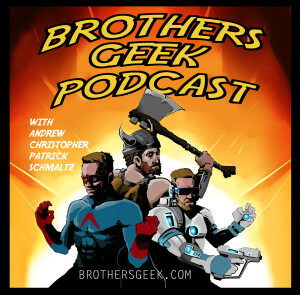 This entry was posted in Podcasts and tagged Ant-Man, Star Wars, Star Wars The Force Awakens, Terminator on April 20, 2015 by BrothersGeekadmin.